If you think you know how to permanently delete files and folders, think again. Do you know that whenever you delete a file from your PC, it doesn't delete permanently. It stays hidden somewhere deep inside your hard drive. Using different paid and free file recovery softwares, the file can easily be recovered.. Whether you delete by pressing "delete" or "Shift + Delete" or "Empty Recycle Bin", that file is still somewhere inside your hard drive waiting for someone to bring it out of hiding. Luckily, there are softwares which can help you permanently delete files and folders from your laptop and PC. One of these softwares is Folder Shredder, a free tool which you can use to permanently delete files so no one can recover it. Folder Shredder is a free tool for Windows that allows you permanently delete files and folders from your PC. It is a very portable application and does not require any installation. The simple interface allows you to easily navigate through the software. It helps you take control of the information you don't want anybody else to find by permanently removing the files and making it impossible to recover the files. Your file is now permanently deleted. 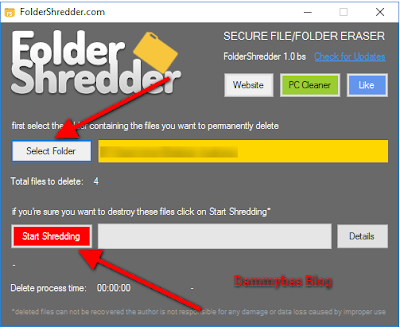 Folder shredder uses the best method to delete files and folders making it impossible to recover the deleted files. It overwrites over and over on alternate patterns, rewrites the files in binary mode, shrinks the file, rewrite the file again, encrypt and renames it, then deletes it permanently. 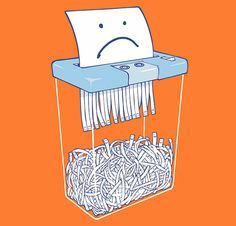 The developers claim the software has the same military grade shredding capabilities with almost 20 times rewrite so that its not recoverable. If you are someone who keeps sensitive files on your Laptop or on your PC. You must download Folder Shredder so whenever you delete the file, it deletes permanently.